Head lice. Pesky little critters aren't they? It's estimated that one in three school-aged children will get head lice at some point during the year, and that as many as one in ten have them at any one time! Children aged between four and eleven are at most risk of contracting head lice, though adults can get them too - particularly parents who may contract them from their youngsters. Unfortunately head lice are notoriously difficult to get rid of, particularly as we may not notice their presence until they've had time to set up home and spawn a few generations more. Having battled with the pests on more than one occasion, I can offer some useful advice for how to really get rid of head lice, along with tips to help keep them at bay. Mature head lice are tiny brown six-legged insects about the size of a sesame seed, while newly hatched lice are the size of a pin head. They thrive in human hair, biting the scalp and feeding on blood. In many cases, an infestation of head lice causes itching of the scalp though contrary to common belief this is not caused by the insects feeding, rather it is a reaction to the congealing substance secreted by lice to close the bite wound after they have fed. Female lice are able to lay eggs between 10 and 14 days after hatching. These tiny white eggs are attached to hair strands close to the scalp and are very difficult to spot. The empty cases remain "glued" to the hair and may become easier to spot as hair grows. Head lice cannot jump or fly; instead they are transmitted through close (head to head) contact, which is why school children - and particularly girls - are most likely to get them. Parents too can get head lice as we are in such close contact with our children. Unfortunately head lice can live away from humans for short periods of time (up to 24 hours), so when treating your household it's important to remember they may be present on bedding, towels and clothes too (see below). If you suspect the presence of head lice in your children's hair, you can easily check by inspecting hair close to the scalp, particularly around the nape of the neck and behind the ears (you may find it useful to use a fine-toothed comb for this). Look for the presence of the small brown creatures themselves, but also for any eggs which will have been laid on hair strands very close to the skin. Checking your own hair may prove a little more problematic if you don't have (or are embarrassed to ask) someone to help you. One easy solution is to comb your hair while bent over an empty bathtub or white sheet so you can spot any critters which drop out. If you discover one member of your family has head lice, you should check everyone for their presence as it is highly likely they will have been passed on to at least one other person (if not everyone). Here comes the hard part. Everyone who has head lice in the household needs to be treated on the same day. ideally in as short a time frame as possible. To really get rid of head lice it is essential that this happens, or those who have not yet been treated may (unwittingly, of course) pass on their unwelcome visitors back to those who have. For each person affected, wet the hair and lather on a large amount of hair conditioner. Don't skimp, this is why I suggest using the cheapest you can find! Leave it to work for a couple of minutes, then work through sections of hair from scalp to end with the nit comb, wiping on a tissue after each stroke to get rid of any lice and eggs from the comb. Pay particular attention to the crown, nape of neck and behind the ears as these are the most common places where lice are found. Repeat until you find no more lice or eggs, then rinse off the conditioner. While the hair is still wet, comb through one final time to be absolutely certain there are no bugs remaining. Be sure to wash all of the towels used to dry hair on the highest heat setting possible to kill any stray lice or eggs. I would also recommend stripping bedding from all beds and washing with the towels on a high heat. Head lice can live away from human heads for up to 24 hours, so washing anything which may have come into contact with the little beasts is a must! If you have a tumble dryer, you can use this instead: head lice cannot tolerate high heat! Over the next fortnight, repeat the hair conditioner/nit comb procedure every 2-3 days (at least five times in total). This may seem excessive, but in my experience it's the only way to be sure that any eggs you may have missed are caught within a couple of days of hatching before they reach maturity. After the initial purge, each combing will be much easier and less time consuming. Once the fortnight is over, your family should be free of head lice, particularly if you are vigilant about washing towels and ensure bedding is changed regularly. However, I strongly recommend checking everyone's hair on a weekly basis and treat as necessary if the blighters reappear. Of all the "nit combs" I've ever tried, the only one which had a truly marvellous effect on ridding hair of lice is The Nitty Gritty comb. 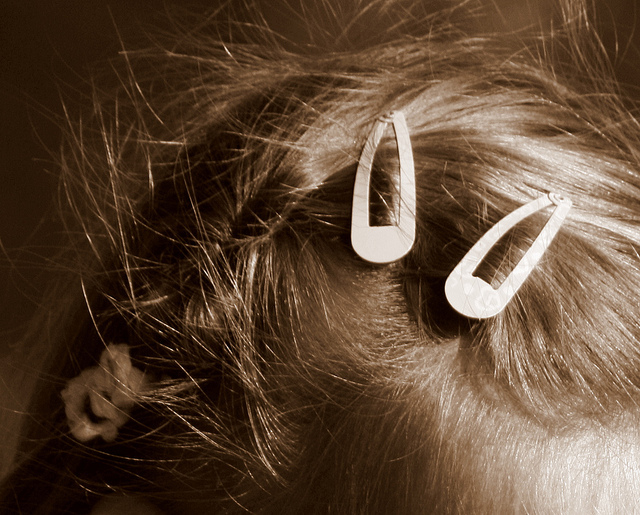 Unlike regular nit combs, each tooth is made of a spiral groove in which head lice become trapped and cannot escape. This design also greatly enhances sliding eggs from the hair strand (which I've found almost impossible using any other comb). The Nitty Gritty comb is slightly more expensive than the regular metal combs which can be bought from pharmacies, but is worth every penny! Some doctors may even provide a prescription for the comb! I recall a description of the comb from the website which explains how the design "renders [head lice] invalid" - in other words, the lice are either killed or severely maimed and cannot simply slide off the comb to crawl back into the hair! (Just in case you were wondering, I am neither affiliated nor was I requested to include links to the Nitty Gritty site. I sincerely recommend this product, based on my family's experience!). Over the years I've spent a small fortune (and had numerous prescriptions) for head lice lotions, foams and oils which were designed to get rid of head lice. Unfortunately, not one of them worked for us. A couple were promising enough, sending the lice into a frenzy as they tried to crawl away from the wicked chemicals or making hair so soft that combing was a breeze, but despite following instructions to the letter, none truly helped us get rid of all the lice and eggs. Save yourself the hassle and don't bother buying any of these expensive "miracle cures". The wet combing method is in our opinion the only way to get rid of head lice! There is no definite way to prevent head lice from returning, though there are a few tips which may help. Firstly, if your child has long hair, try to tie it up or plait it when they are at school or in close contact with other children. Tea-tree oil spray can help repel the little beasts, and can be purchased from pharmacies or made at home by adding a few drops of oil to a spray bottle of water. Tell anyone who has been in close contact with your children know about the head lice (and that your family has been treated). As I mentioned earlier, head lice is nothing to be ashamed of. You've already acted responsibly in treating your family, and hope to ensure others do the same once they become aware of the situation. Lastly, be vigilant! Check your children's hair weekly if possible, which helps catch any lice before they have much chance to settle and breed. Do you have any extra tips? Like many others reading this article, I'd love to know of any other tried and tested tips for getting rid of head lice or keeping them at bay! Please feel free to share your suggestions and comments using the form below.